If you are looking for a half ice hockey drill that gives your goalies a lot of shots from different angles then this is one to consider. It is a good drill for younger players and is a good one to be used for game or practice warm ups. Place half of the players in each corner with the pucks. On the whistle, the first three players in the first line go with a puck. The first player (P1) skates straight ahead out to the blue line, makes a control turn towards the boards and skates back into the zone for a shot on net. This drill is as much for the goalies as it is for the players so make sure the players stay in their lanes to take the shots. The second player in line (P2) skates out to the blue line as well but towards the middle of the ice. They do a control turn as well (back towards the line they started from) just outside the blue line and come back in the middle lane for a shot on net. The third player (P3) does the same thing except they skate to the opposite side of the ice, make their control turn, and come back into the zone to take a shot from the outside lane. After the third shot on net the next three players from the other line begin. 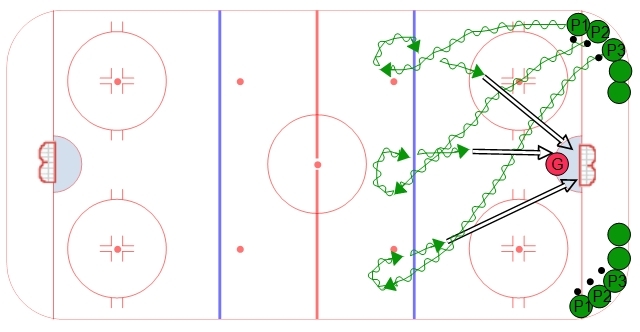 This is a good one to add to your half ice hockey drills collection.